If the Jaguars are going with Chad Henne—and it’s trending that way—here’s why they might be best off just cutting Blake Bortles. 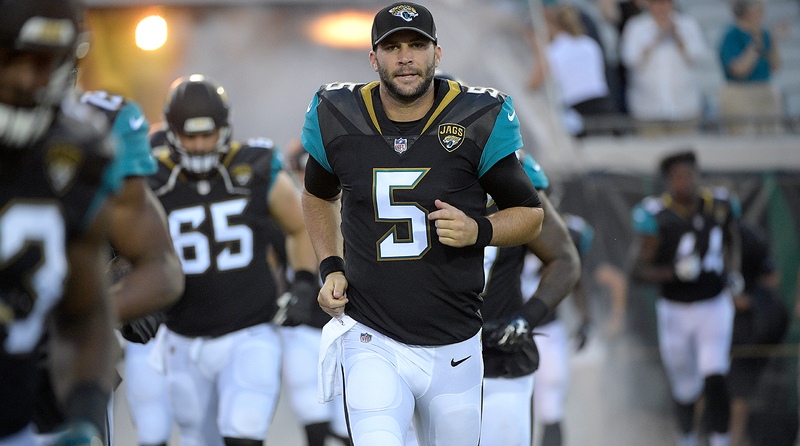 In three years as the Jaguars starter, Blake Bortles’ completion rate has never topped 59 percent for a season. 1. If the Jaguars are going with Chad Henne—and with the decision to start him Thursday night, it’s trending that way—they might be best off just cutting Blake Bortles. If he goes in as the backup, in an emergency situation, that puts his $19.05 million injury guarantee in 2018 in play. And keeping him around as a game day inactive makes no sense. Why did the Redskins do that with Robert Griffin III in 2015? It was a concession to owner Dan Snyder and president Bruce Allen in making the move to start Kirk Cousins. They, of course, mitigated the injury risk by dressing Colt McCoy, rather than Griffin, as backup to Cousins. 2. Broncos coach Vance Joseph told me in May that decision-making would be the primary quality that would decide the starting quarterback debate. And he was true to his word there in picking Trevor Siemian. But make no mistake, this one wasn’t close. Siemian was clearly the better option. And so now Paxton Lynch becomes the third first-round quarterback since 2008, joining Tim Tebow and Johnny Manziel, to fail to win his team’s starting job by the start of his second year. 3. File away this name: Desmond King. He was one of the Big 10’s best defensive backs the past couple years at Iowa, but fell in the draft to the fifth round because his testing numbers were average. By the time the Chargers broke camp, the safety had impressed his coaches to the point where it’s a good bet he’ll play a big role in the fall. 4. Speaking of rookie defensive backs, the Cowboys figure to be relying on two of them—Chidobe Awuzie and Jourdan Lewis—to mitigate the veteran losses they suffered in March in the secondary. Both have been good, but hamstring issues have robbed each of reps. And that’s not great, given the defense might have to be a little bit better early with the offense missing Ezekiel Elliott. 5. The impact Colin Kaepernick has made with his million-dollar pledge is undeniable. But I haven’t moved off the points I made in June. This isn’t a black-balling, and the decline of his football value is a big reason why his protest has made him hard for teams to sign. What teams are willing to absorb for the third or fourth best player on the roster is different than what they’ll absorb for the 30th or 40th player on the roster. And, again, he’d help himself by talking. 6. On Aug. 3, the Dolphins lost both QB Ryan Tannehill and guard Ted Larsen, and so it’d have been easy to for the team to bring a Chicken Little attitude to practice on Aug. 4. Instead, Miami had one of its best days of camp. The coaches took notice. And they’ll remember it if the season goes as they hope. 7. If the Saints are going to turn it around defensively, finally, then they’re going to need their first two draft picks, corner Marshon Lattimore and safety Marcus Williams, to play big roles in that effort. Early indications are good on that. 8. We knew the rookie running back class had loads of potential, and we’ve seen all of that this summer. Maybe most impressive, though, is its depth. To that end, here’s a fun name to watch—Bears running back Tarik Cohen. At 5'6", 179 pounds, he has a little Darren Sproles (who GM Ryan Pace knows well) in him. 9. Like my boss, I have trouble mustering anger over the low hit from Briean Boddy-Calhoun that nicked up Odell Beckham. The NFL made a choice to allow those shots, rather than high hits to the head, and so defensive players only have so many ways to take down opponents. It’s football. And I wonder if people would be so angry if it was someone with a lower profile than Beckham going down. 10. Roger Goodell’s looming five-year extension should surprise no one. Pete Rozelle, a PR guy, was made commish when the league needed promotion. Paul Tagliabue, a lawyer, became boss when labor strife was at a fever pitch. And Goodell, a master at creating new revenue streams, won the job when guys like Jerry Jones and Robert Kraft wanted to grow the financial pie. Bottom line: If Goodell keeps doing that, he’ll remain in good standing in ownership circles.